As the choppy waves of the Gulf of Mexico rock against the side of our Princess cruise ship, my family of nine sits in a circle and reflects on the past. Five days have passed since my parents, aunt and uncle, cousin and her fiancé, my grandma and grandpa (on my mom’s side) – Bibi and Zeide as we like to call them – and me boarded to take a winter break vacation cruise from Miami down the Gulf of Mexico to Honduras, Belize and Mexico. Our discussion transitions seamlessly from family get-togethers years ago to old relationships, as story after story bring a warm and authentic laughter to everyone in the group. My attention, however, alternates from my grandfather to the subject of his gaze, as he looks longingly off the starboard side of the vessel. Quickly the conversation changes again, this time shifting the attention toward me and my life back at school. As I begin to recount my year at Northwestern, recapping grades and extracurriculars, my eyes return to Zeide. It doesn’t take a mind reader to see that my grandpa’s thoughts are clearly elsewhere. He takes another look through the adjacent window and out across the water. I ask for him to tell us a story, one that we’ve all heard many times before, but one we won’t soon forget: the tale of my Zeide’s exodus from Cuba, just in time before Fidel Castro took supreme control. He chuckles and obliges, recounting his earliest memories as a child growing up in Havana, the moment when he met and fell in love with the woman of his dreams, my grandma, all leading up to his departure from Cuba to Miami for a better life for his family. For some reason, however, in this moment listening to Zeide tell his story, I feel as though I’m hearing it for the first time. When I was younger, I thought of my grandpa mostly as the kind-hearted, domino and poker playing, big bellied, generous and lovable man who took me for pizza and ice cream. His distant past in Cuba and his exodus for good during a tumultuous political period never really crossed my mind in the meaningful way that it should have. Zeide left the place that he had lived his entire childhood, at about the age I am now, with little more than a suitcase and set sail for the unknown. If he hadn’t taken this courageous leap of faith, who knows what my world would look like today? I continue to listen deeply and wrap my head around the past in ways I hadn’t before. Zeide embraces his identity as a Cuban emigrant but lives life to the fullest as an American immigrant. Since the moment he set foot on American soil, he did all he could to make life better for his loved ones, without ever second guessing his decision to leave the land that he loved and held dear. Through the window behind my Zeide, an island briefly becomes visible on the horizon. And as the clouds clear, everything comes together like the last few pieces of a puzzle. In over 50 years since he left his home in haste, I realize that this moment marks the first-time Zeide has been this close to his homeland. Yet as it has for the past half century, Cuba remains out of reach. I look back at the group, and without skipping a beat, Zeide smiles, jokes and laughs. As always. Although the heartbreak must be unbearable, Zeide’s perseverance and character makes this moment a positive one. 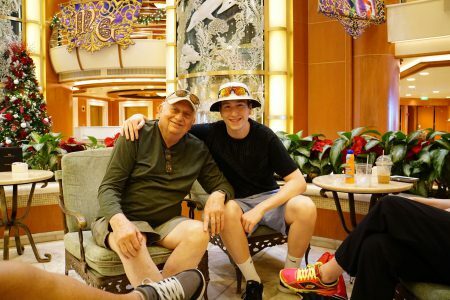 Instead of dwelling on how far away Cuba is from where we sit on the deck of the cruise ship, Zeide focuses on how close he is to his family and that we’re all together, in the moment. It’s through moments like these, and the life that my grandfather has come to live, that I now know the importance of bravery, determination and the meaning of home. Not to mention a goal to strive towards: to live life to the fullest. Hopefully one day I myself will be able to tell my life’s story to my kids and grandkids while relaxing on vacation. And while it’ll undoubtedly be different than my Zeide’s story, I know that’s what he’ll want, because he continues to live his life striving to make the lives of everyone in his family better, every single day. And no matter how close or far I am to where I grew up in New York City, in that moment, I’ll know I’m right at home.